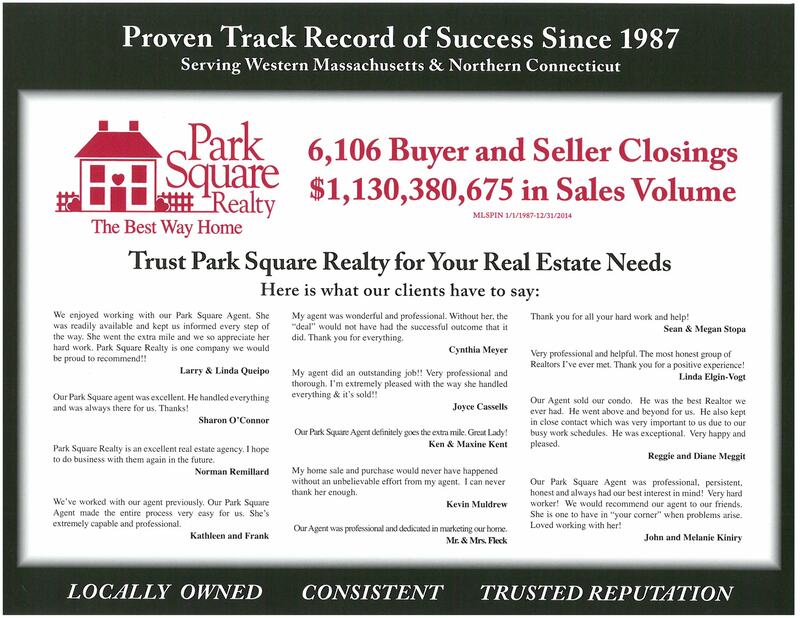 Park Square Realty is a full service residential and commercial real estate company based in Western Massachusetts. We have been assisting home buyers and sellers with high quality service and knowledgeable advice since 1987. Founded by Carolyn Cassell-Coughlen, Kate Cheever and Jeanne Mitchell, the company is now owned by Carolyn's son Ted Cassell. Ted joined Park Square Realty in 1994 as an agent and purchased the company in 2001. Park Square continues to experience strong growth in sales volume, number of agents and the number of markets we serve. We have achieved this success by investing in the systems and technology to better serve our clients and by focusing on the needs and desires of each individual home buyer and seller. Park Square Realty is a firm of full time professionals who are caring, conscientious people you can depend on. Our agents subscribe to the Code of Ethics of the National Association of Realtors which establishes a higher standard of practice for member real estate professionals. This means you can expect your real estate transaction to be handled in a diligent and ethical manner. Our agents are knowledgeable of the current market, provide innovative solutions and get the job done for you. Park Square Realty has agents available who speak Portuguese, Russian and Ukrainian. Please contact one of our offices and we can connect you with an agent that speaks your language. The Park Square goal is to be your Realtor for life, assisting you, your family and friends, now and in the future. At Park Square Realty, we recognize our agents are our greatest asset. We provide extensive training for new agents and ongoing training to all agents. We have implemented many innovative systems to help make our agents more productive and successful. This is beneficial to our home buyers and sellers as their transactions are handled more efficiently with less stress. Statistics have shown that our systems are effective and Park Square Realty's per agent productivity far exceeds our leading competitors. Recent client surveys have indicated Park Square agents are "professional", "detail oriented" and have gone "above and beyond" in their transaction.